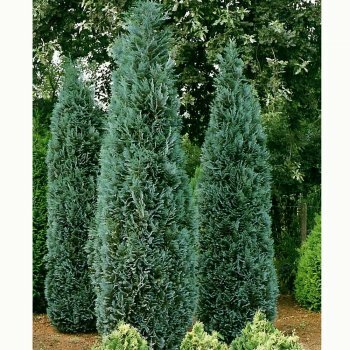 Chamaecyparis lawsoniana Columnaris Glauca, more commonly known as Lawson's cypress Columnaris Glauca, is one of the best upright blue Lawson's - a striking medium sized evergreen conifer. It exhibits fragrant, blue-grey foliage that is especially vibrant in summer and provides a wonderful feature in the winter garden. This False cypress Columnaris Glauca has a columnar shape with narrow habit and is the ideal choice for an attractive screening hedge or a fantastic specimen tree. Lawson's cypress Columnaris Glauca is a hardy tree that grows well in both full sun or partial shade and is tolerant of all soil types, preferring slightly acidic, well-drained conditions - it dislikes waterlogged soils. This beautiful ornamental tree is suited to both exposed and sheltered positions, reaching a final height and spread of 3 x 1 metres in 10 years. Our pot grown Chamaecyparis lawsoniana Columnaris Glauca can be planted at any time of the year. Firstly, remove all weeds and grass within a metre of your desired planting hole, then dig a square hole as deep as your root mass and approximately 2x as wide. To help Columnaris Glauca establish more effectively, we advise sprinkling root grow in the hole. For detailed step by step instructions, visit our help and advice section. If you’re planting Lawson's Cypress Columnaris Glauca in spring, summer or dry weather, water well and regularly for the first few months. Keep an eye on young trees and increase watering if there are extended periods of hot or dry weather. If you’re planting in autumn, you may only need to water your tree a little. We stock a range of irrigation kits, suitable for a variety of planting schemes. Conifer trees, such as Columnaris Glauca, do not require a lot of pruning. Simply remove any dead, diseased or awkwardly placed branches as and when you see them.